The extraordinary new AmaMagna is currently enjoying a bit of leisure at the Port of Constanţa in Romania on the western coast of the Black Sea. Why? Because this floating haven of rejuvenation has such grand dimensions and offers such incredible personal space that she cannot sail narrow waterways to get to her next temporary home—she is taking an epic ocean voyage to Rotterdam, Netherlands. 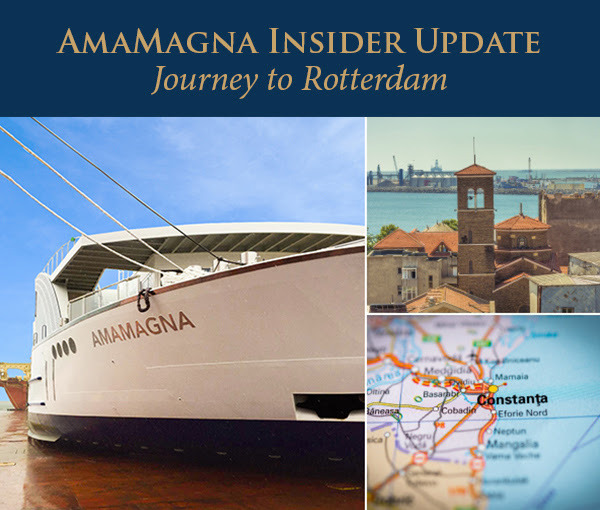 Once dry docked in Rotterdam, AmaMagna will be meticulously outfitted with luxurious furniture and eclectic contemporary design elements, receiving the finishing touches in such venues as her expansive Health & Wellness Studio and exclusive Wine Bar and restaurant.